We are currently looking for sponsors for our 2018 Stuff this Bus event! 🚌 Join the movement to end poverty and promote your business! Get their logo on our sponsorship list on our website! 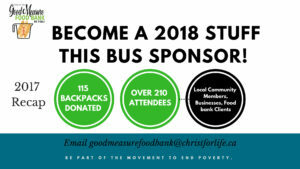 Email goodmeasurefoodbank@christforlife.ca for sponsorship inquiries or questions!